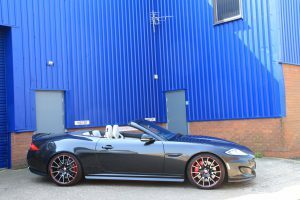 Jaguar XKR Styling and Pampering Makeover : A styling and pampering makeover for a Jaguar XKR was recently carried out by VIP Design. This newly purchased Jaguar XKR was in for the full VIP treatment before the customer had even seen the vehicle. The VIP Design makeover consists of a series of mechanical and software upgrades designed to get the very best performance from the vehicle. The first aspect of the VIP Design conversion was the addition of high-flow air filters, which allow much greater airflow throughout the engine and boost combustion and throttle power even further. An uprated upper supercharger pulley and lower supercharger pulley were also added, which increase supercharger boost pressures, and bring the software upgrade to life, by matching the enhanced fuelling of the software upgrade and increasing power delivery throughout the whole rev range. A high quality, hand built, Jaguar XKR charge-cooler was added to decrease charger temperatures and increase cool air density in the engine air intake, which boosts performance and power delivery of the Jaguar XKR even further. A full Jaguar XKR performance exhaust system was fitted, including 200-cell sports cats, which are integrated into a large-bore downpipe. These substantially reduce back pressure and increase flow rates of exhaust gases through the engine, while keeping emission levels fully road and MOT legal. Performance exhausts and sports cats work exceptionally well with Jaguar XKR remapping, and can boost the power of the engine by up to 25bhp in the mid-range. The Jaguar XKR performance exhaust doesn’t only add power and performance but it also looks the part, adding an element of subtle styling to the rear of the vehicle. Under the bonnet, the VIP Design conversion remapped the ECU to 650bhp which yields an extra 80ft-lbs more torque. The pure power and performance achieved by the Jaguar XKR ECU remap in combination with the mechanical modifications is not subtle. The final element of this VIP Design Jaguar XKR conversion was a set of lowering springs, improving its poise and stance on the road. These lowering springs dramatically improve the appearance of the Jaguar XKR as well as its performance by lowering the centre of gravity and reducing body roll. For more information about how you can give your Jaguar XKR a VIP Design makeover, please visit www.vip-design.london, contact us now on +44 (0)1789 774444 to discuss your requirements, or email enquiries@vip-design.london and one of our team will get back to you.